If you are ready for a new Knitting or Jewellery challenge, this class is the perfect introduction to knitting with wire and beads. If you are a Beader, a Knitter, an Embroiderer, a Weaver or just plain nutty for everything textile, here is a class for you. With over 10 years of teaching these specialist wire techniques Teri will give you tips and tricks that you won’t find in any books. When most experienced knitters try knitting with wire for the first time, they give up in frustration, dissatisfied with the results. What they really need to learn is wire's unique behaviours, which wire to use and where to get it. This class is the perfect introduction to knitting with wire - but it is ESSENTIAL you already know how to knit (I am happy to remind you if you are a bit rusty!). 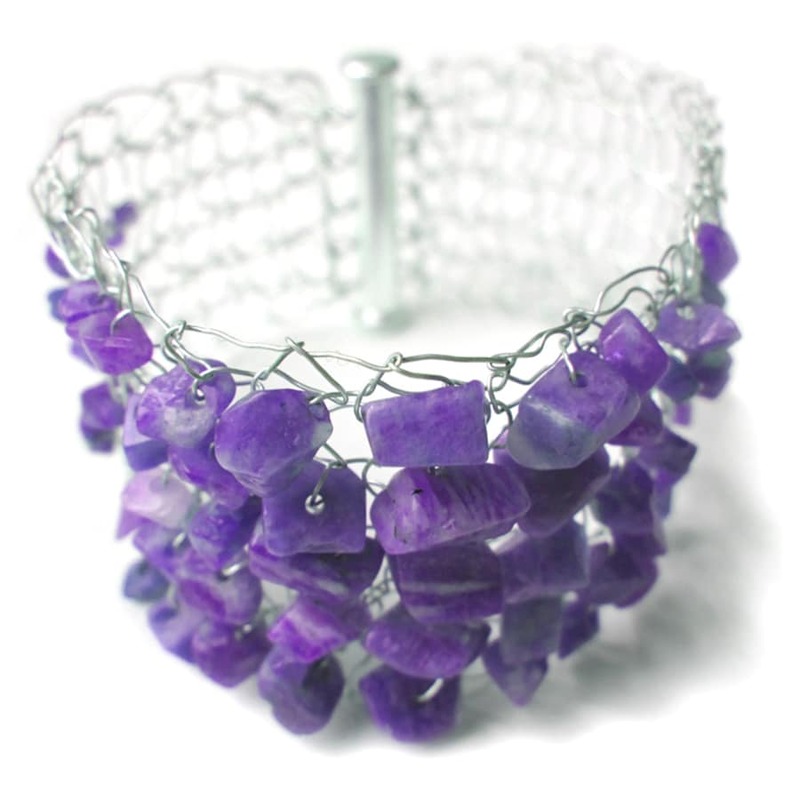 Join me at Cockpit Arts, Holborn for a day of fun making a Knitted Wire Cuff.. Working with soft silver-plated wire we will cast-on and knit short rows in knit and purl stitches. 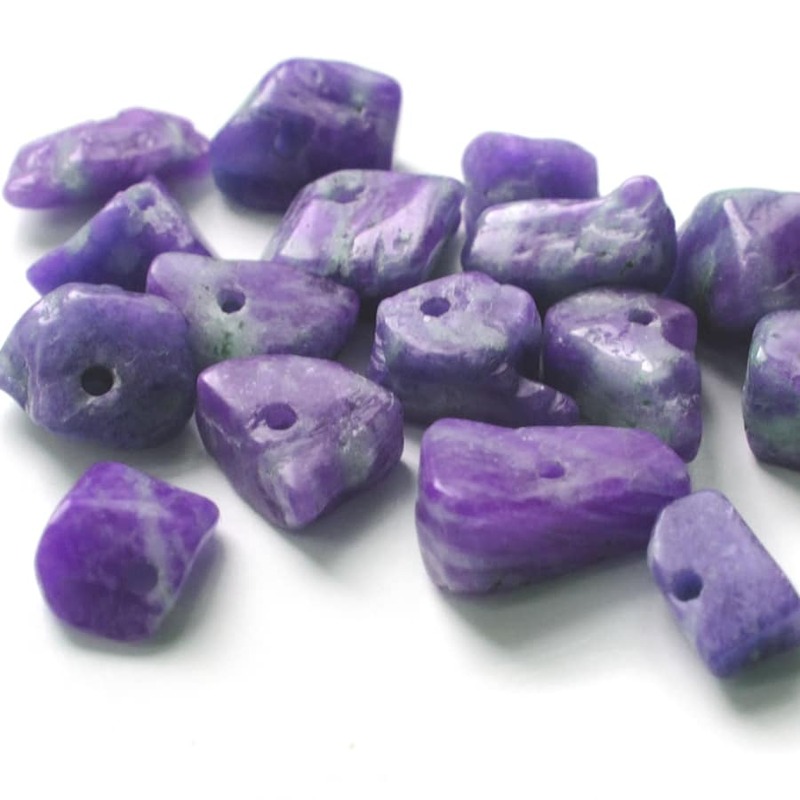 We then begin adding semi-precious beads along the way - finally casting-off and finishing off your knitted cuff with a secure clasp. 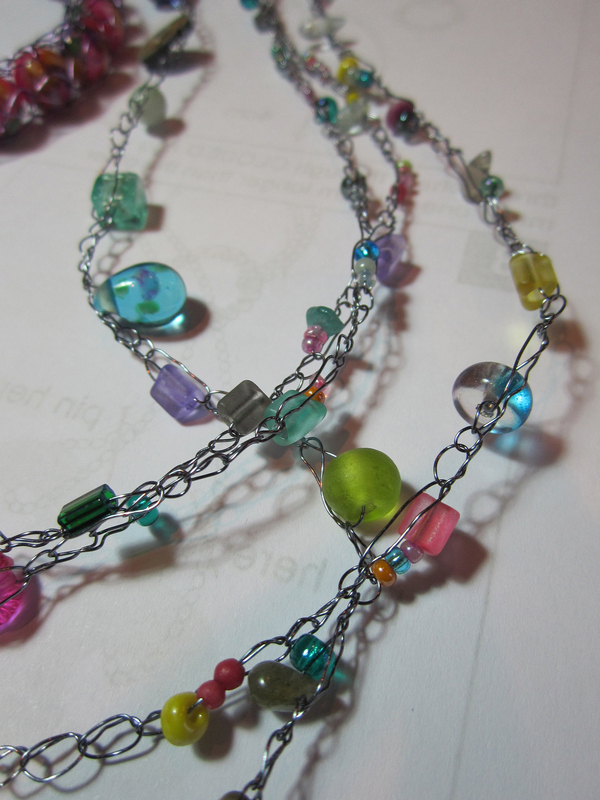 Any time left over at the end of the class will allow for a bonus tubular beaded necklace design or quickie earrings. This project is ideally suited for using Fine Silver - a high carat silver which is softer than Sterling Silver and easier on the hands. If you would like to try using Fine Silver I can order you a reel for an extra £35 - please message me after you have made your booking. 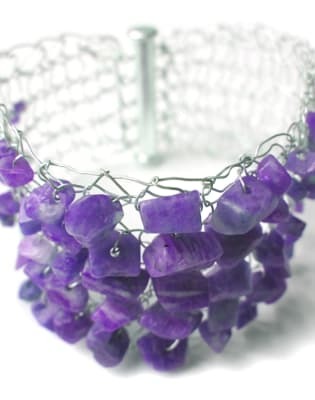 All your materials are provided, including knitting needles, a reel of silver-plated wire, your choice of pretty semi-precious stone chip beads, a silver-plated clasp and a step-by-step project book to keep. With small class sizes individual instruction is possible, so no-one is left struggling on their own. Take home whatever you have left to carry on making at home. Information is given on materials, suppliers and suggested reading. If you wear glasses for close-up work you will need to bring them. All tools will be provided. Classes run from 10.30-4.30pm. We break for lunch at 1pm for an hour - you are welcome to bring your own lunch or pop out to the nearby shops and cafés. Free tea, coffee and biscuits are available throughout the day.